Ever wonder what holds your vehicle’s engine in place? How does that big engine sit in just the right spot? The engine is attached to motor mounts. 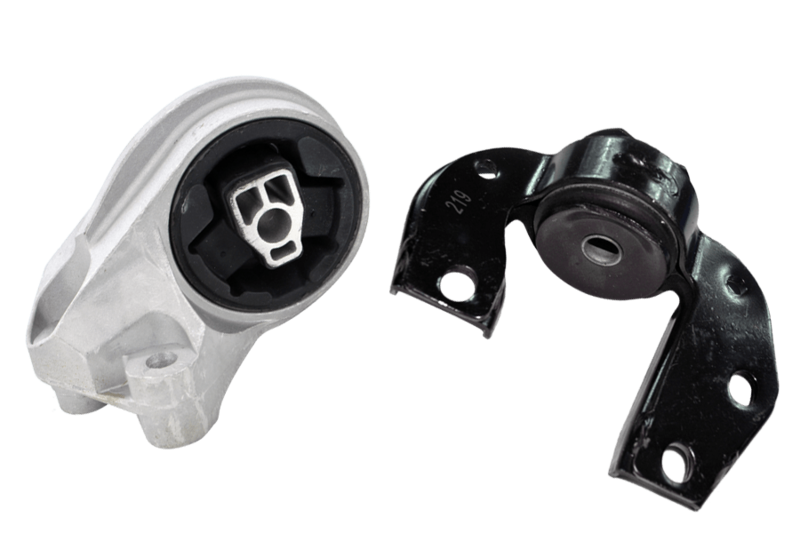 These are steel and rubber mounts that hold your engine and transmission in just the right spot to function properly. Attached to the body of your vehicle this component plays a major role in the smooth running of your automobile. Engine mounts are designed to perform a few jobs. Attached to the frame of your vehicle engine mounts position the engine and transmission in just the right location for your vehicle to operate, although transmission does have their own mounts the two are buttoned up together. These parts also absorb engine vibration so that your car runs smoothly. Without these components, your car’s engine would vibrate terribly. Mounts have rubber bushings that absorb the engine’s natural vibration. Additionally, when you hit nasty potholes and other road hazards the mounts take a tremendous amount of force and retard that force so your engine does not move out of position. As you can imagine this is an incredibly important component. With normal everyday driving the stress on the mounts is constant while driving. Like with all things over the course of time the stress can and will make the part fail. A broken motor mount is not catastrophic but it does create undo stress on your engine. With your engine, even a few degrees off its position adds stress to the other mounts and your transmission. Left unchecked this can cause major damage over a short period of time. If the bushings wear out over time, this too will cause your engine to vibrate. You will be able to tell if you have a broken motor mount or bad bushing. You will feel the engine actually move a bit when you press the gas, it might even make a popping type noise. Most certainly you will feel the vibration of the engine in the passenger compartment. With any component that goes bad in your car, truck, van or SUV it’s vitally important not to let failing parts go unchecked. Budgets for most of us are stretched to the limit. However, failing parts can cause other problems down the line. Undo stress on other components can cause multiple and more costly repairs. Preventative maintenance is always a good idea. Keeping engine compartments free of dirt, oil and other fluids will help your car’s components last longer. It’s a good idea to carefully clean your engines compartment at least four times a year. Road salts and other debris from roadways can reek havoc on bushings, hoses and other open parts. Take quality care of your vehicle and you will enjoy years of worry free driving.